It seems pretty to clear to me that the work of Christ in the incarnation, on the cross, and in the resurrection has ushered in a new kind of kingdom; a kingdom “not of this world”. If that is the case, then the Kingdom of God now exists in the “hearts of men” and not in buildings or even special places of creation. 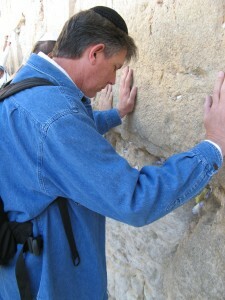 In the technical sense, then, there are no “holy places” we can visit on a tour bus or on a plane. Still, there are those physical places that seem to hold a unique place in the heart of God that we might refer to poetically as “holy”. Today I stood in one such place. 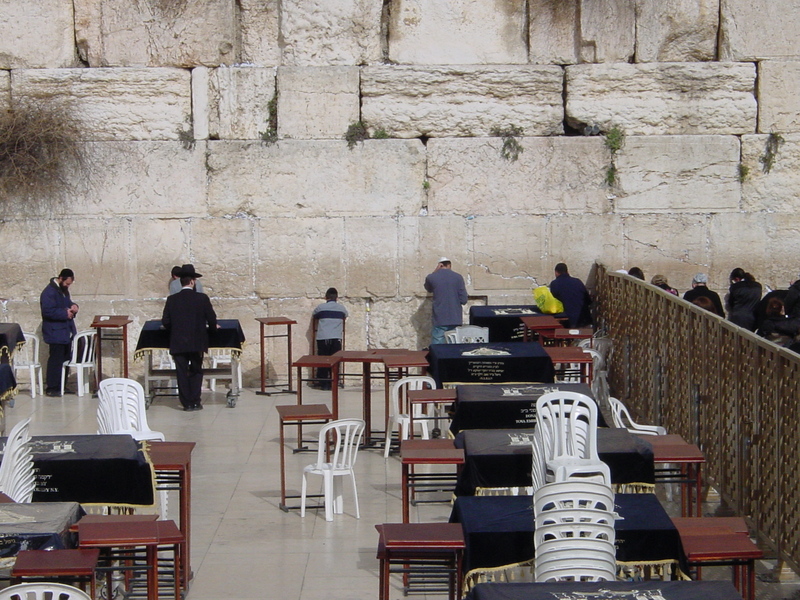 The last Jewish temple was destroyed in 70 AD by the Romans in response to a Jewish rebellion. 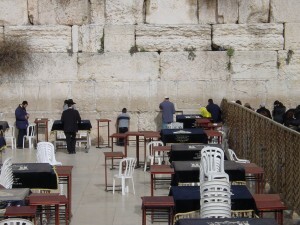 All that remains of that temple is a portion of the western retaining wall; now referred to as the Western Wall or Wailing Wall. (It’s not actually part of the last temple.) It was unearthed several centuries ago. Jews of every generation since that time have considered this fragment of the former temple mount as “holy” and come here to pray. Today I stood at this special place and joined dozens of others in praying to God. It’s hard to describe the sense of humility I felt in that place. Unlike any place in the United States, I was aware that I was now standing in a relatively small place where millions of people have stood before over a span of time covering many centuries. I was merely among the most recent. Humbling. Further, I remembered that over the centuries there have been numerous battles fought, lives lost, and kingdoms overthrown on this very piece of ground. Today the sun was shining, the temperature was warm, and I stood there in my comfortable jeans and jogging shoes. In a few days I’ll return to a comfortable home, nice job and loving friends. It was a good reminder that my problems are pretty small by comparison. Perhaps most humbling was the recognition that I have value only because Yahweh declares that I have value. The massive stone I leaned against did not choose it’s place or purpose. Somehow in the sovereignty of God that stone was placed in that particular place and, thereby, assumed an enormous value no one could have anticipated. I don’t know why God has placed me in any particular place. I did no more to deserve His appointment than those stones. And yet, He did choose me. He does have a place and purpose for me. My prayer as I stood there humbled by the place was that God will place this “rock” where He wants me and that I may become a “holy place” in the lives of people just as that rock became such for me.